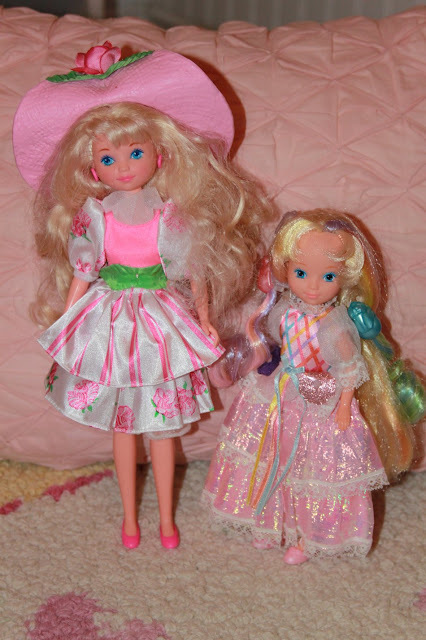 Peppermint Rose was a short-lived, unsuccessful toy line by Mattel in 1992. More info on the toy line here. It's fairly well known in the toy community that Mattel recycled the face mold for Lady Lovely Locks dolls to create Peppermint Rose. She also had a Skipper body (sort of androgynous, without much of a chest). Since my goal for the year is to complete my Lady Lovely Locks collection I bought a Peppermint Rose doll just to compare. As you can see, Peppermint is quite a bit taller. Her face paint is also different, and she has earrings. 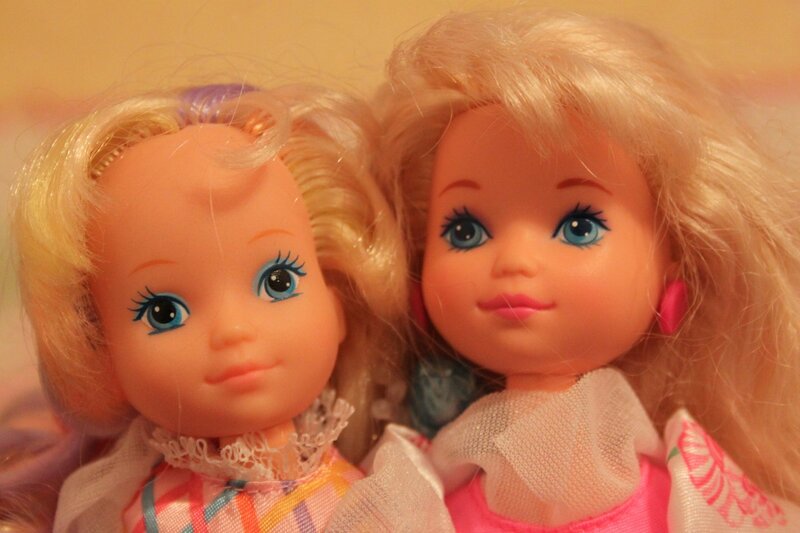 You can also see that they changed the cheeks and enlarged the head by about a sixteenth of an inch in diameter. Her hair is also much fuller. Her hat does not fit Lady's head at all. Just thought you collectors out there might find this information interesting. I personally think the Peppermint Rose line is very cute, especially the bunny friends. But you can tell the dog doesn't trust her. So my husband graciously understands and loves thrifting too, and we've started on ebay with a few items. I know there's no "real" value to used CPKs but I want to amass them...and hopefully one day give them away to people I love. The thrill of the find! :) Great blog, and I'm going to read through the rest of your posts. Love the photo with your dog, what an expression!! Very funny indeed, I agree! 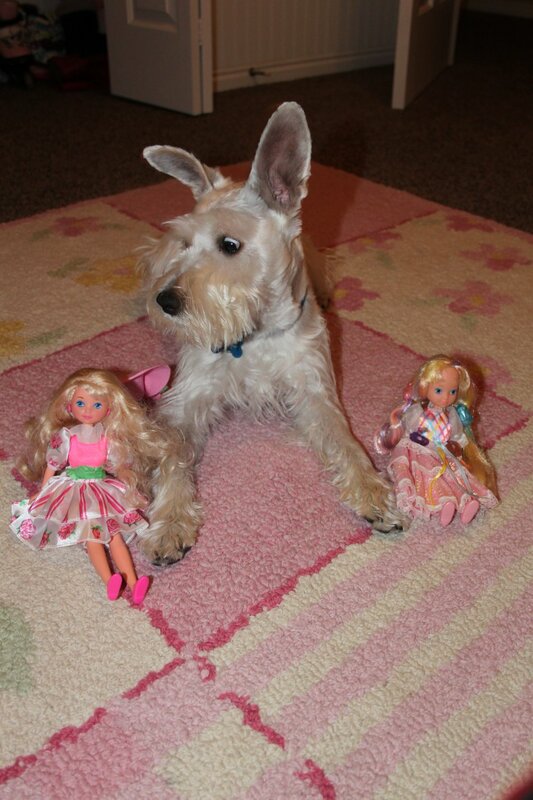 The photo with the dolls & your dog is priceless! Thanks for the comparison between the dolls - I've never seen either in real life, but perhaps I'll run across one eventually! I do have a Peppermint Rose bunny from my childhood though. I'll have to dig it up next time I'm at my parent's place. Hi! 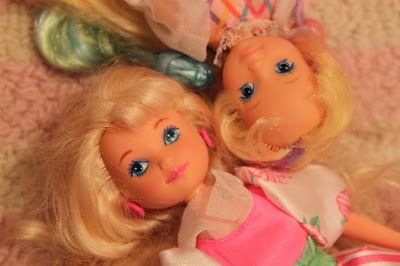 Are always on sale Sunnypeek doll $ 5 and Ballerina Lady Lovely Locks (Missing Pixie tail) $ 30? Are Vintage Toys for Kids?